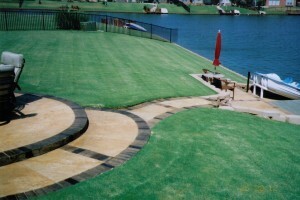 Bill’s Custom Concrete Inc. has been providing unique patio designs to many of your friends and neighbors in the Choctaw area since 1976. Our highly skilled professionals will meet and exceed your expectations by providing superior workmanship and exceptional customer service. If you are looking for a unique and stunning patio design in Choctaw, please give us call so we can show you examples of our work and help you create a design that is functional and amazing to look at. Our team of specialists at Bill’s Custom Concrete have done millions of dollars worth of patio designs in Choctaw and the Oklahoma City Metro, including concrete floors, stamped concrete, decorative concrete and many other types of concrete work. When it comes to designing patios, many architects call concrete magic mud because it has the ability to be designed into unlimited designs and shapes. My team of concrete professionals can design a patio for you in a number of finishes, textures, shapes and colors. When we sit down with you to design the patio, we will listen carefully to your needs and take your input and show you some spectacular ways we can accomplish the job. When it comes to building you a patio, we are limited only by our imagination. We want your patio to be a place your family can sit and relax in comfort for many years to come. Our custom concrete patios can be finished in a broom finish, an aggregate finish, a smooth finish, a float finish and a stamped pattern finish. We will sit down with you and explain all these different types of applications and let you decide which works best for your home. In addition to the finish, we can offer you numerous types of patterns, including rock, tile, brick, stone and more. Our experts even have experience in scoring a pattern into the cured concrete for you, so the possibilities for creating a one of a kind patio design are endless. We can also use stencils to create some unique designs in the patio. To create a one of a kind looking patio, our team can also color your patio with an integral color. This process simply means we mix a color into the wet concrete. Your patio will be the envy of the neighborhood at your next barbecue. Our mission at Bill’s Custom Concrete is simple, to provide the highest quality concrete and patio designs to our Choctaw customers. When we work with you as a client, we consider you a very unique partner, who has very specific and individualized needs. We have been working in the concrete business for almost four decades, and that experience has given us the opportunity to be the premier concrete solutions company in the Oklahoma City Metro area. We do not want you to be treated like you are simply a number, and we strive to meet all your expectations. Our staff is ready to visit you and help design a stunning one of kind patio for you. Please call us today at (405)755-3975 for your free consultation, and we look forward to serving you soon.